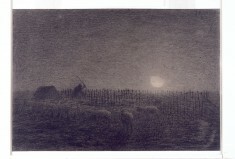 Description In this nocturnal scene, the waning moon throws a mysterious light across the plain extending between the villages of Barbizon and Chailly. 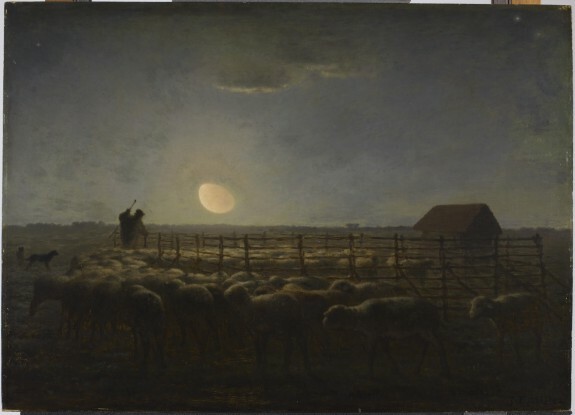 Millet was recorded as saying of the solitary shepherd: Oh, how I wish I could make those who see my work feel the splendors and terrors of the night! One ought to be able to make people hear the songs, the silences, and murmurings of the air. They should feel the infinite. . . . Although educated and trained in Paris, Millet was born into a peasant family from the Normandy region of northern France. Millet drew on this background, specializing in scenes of peasant life. An outbreak of cholera in 1849 forced Millet to leave Paris with his family and settle in the village of Barbizon, where he became acquainted with the Barbizon artists Théodore Rousseau, Virgile Narcisse Diaz de la Peña, Constant Troyon, and Antoine-Louis Barye. In the Forest of Fontainebleau: Painters and Photographers from Corot to Monet. National Gallery of Art, Washington; The Museum of Fine Arts, Houston, Houston. 2008-2009. Provenance Chevalier A. de Knyff [date and mode of acquisition unknown]; Sale, Vente C (Carlin), Paris, April 29, 1872, no. 19; Mme. William Hooper, 1872, by purchase [via the dealer Paul Durand-Ruel]; William T. Walters, Baltimore, 1884-1887, by purchase; Henry Walters, Baltimore, 1894, by inheritance; Walters Art Museum, 1931, by bequest. Inscriptions [Signature] Lower right: J.F. Millet.